Thirsty Pilgrim: The Pub at the End of the World. The Pub at the End of the World. The Black Sheep Pub is not a business. Owners Joe and Helena Wygal might call it a particularly expensive hobby. One friend described it as a museum. The word I'm going with is shrine--as in, a shrine to pubs everywhere and the beer that flows through their veins. 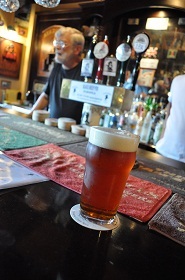 "I love the pub culture," Joe said over nonic pints. The beer was cool and not cold,* but the glasses sweat anyway in Guanacaste's jungle heat. "I had to start my own down here. It's not a replica. It's just a tribute." 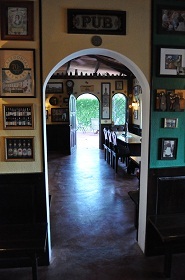 The pub is its own small building but is essentially a part of the Wygals' private home. It is up in the hills near Nosara, popular for surfing and yoga and for being pretty far from anywhere else. Coming from San José, depending on traffic, you might be in for four hours of pavement and 45 minutes of gravel road. We arrived at our hotel in Nosara and called the number, according to prior instructions. Gunter came to pick us up, and that's when the road got really bumpy. His stories distracted us from the fear that the potholes would rattle his doors off their hinges. And he came from the same city in Germany, Kiel, where my grandfather was born. Of course he did. Utterly reasonable prices reinforce the fact that this is not a for-profit operation. In reality the prices are more like donations to keep the shrine going. As a rule the Black Sheep is only open Saturday evenings, the occasional drinking holiday, and private parties. Prospective visitors should call 8928-5752 to inquire and ask how best to get there. Maybe Gunter will come pick you up. *Update: Joe and Helena sent me a message, concerned that the everyday drinker would misinterpret this and think that the beer is un-cold. They prefer to describe it as "just cold enough." So there you go. Oh man, I gotta go. Great article! The Session: What Makes Local Beer Better? More Educational Hedonism in Belgium.